The breeding season has come to an end on Coquet, and the final numbers are in. The dry spring and good fish supply has brought good news all around – with the exception of the Eider ducks who struggled. Several records were broken, with more Kittiwakes than ever before breeding on the low cliffs. The first pair nested on the island in 1991, and this year this number has grown to 448 pairs. 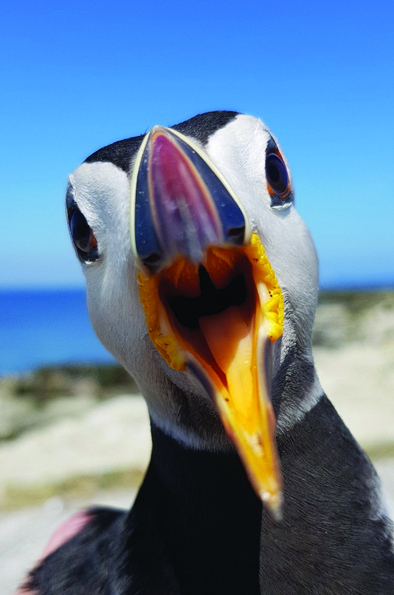 2017 wasn’t a census year for puffins, but they looked to be in good number and fine fettle! The puffin pictured above was particularly feisty after making a novice mistake of getting stuck in the night hide wood pile (we think it was trying to find a new burrow). After letting him out – there was just time for this quick close up before he headed back out to sea. The terns had a fantastic year on the island, under the watchful eyes of the wardens. Well over 1,000 Sandwich terns nested including adults from Holland. In-fact the exchange with Dutch birds became particularly evident with a bird colour ringed 1T5. This individual visited Coquet and then returned to Holland within a few days! It was then seen a few days later in Scarborough. The Common and Arctic terns also did well, and a record breaking 1,579 Arctic tern nests were counted. Arctic terns also had the highest productivity (chicks fledged per pair) on record. The Common tern population increased and sits near the top of all time highs, as does their productivity. The season drew to a close quickly, which is a good sign as a lingering season means lots of re-lays and later nests. Roseate terns had a super year. The population reached 111, an equal highest on record with 2015. As well as this, all the hard habitat work paid off with the highest productivity on record! That means more rosy chicks than ever before fledged this year (166). Having this many chicks fledge and join the meta-population is a real step in the right direction and exceeded the productivity on Rockabill in Ireland (the European stronghold). Work is underway to repair the damage done by the seabirds over the summer (undermining paths, removing guano from solar panels, restore the roseate terraces), and tackle removing a lot of vegetation they have let grow up around them (it’s not wise to try and mow it while they are nesting). 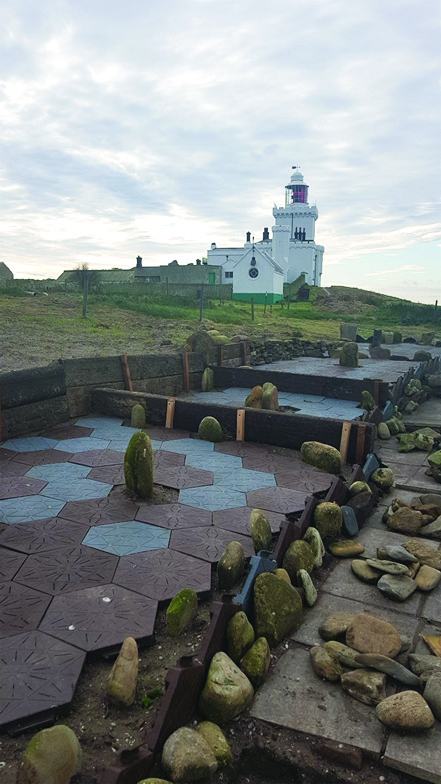 To help keep up with the growing roseate tern population, and in hope that all of this year’s chicks return one day, we have constructed a new terrace. This terrace will give us space for another 100 boxes, as well as helping protect the existing north terrace from being buried by the cheeky puffins as they excavate their burrows. One of the roseate nest boxes was equipped with a miniature camera so that we could peek into the day to day life of a pair of roseate terns in their home. The live footage was transmitted over the internet to a dedicated website for the world to see. We found the first eggs on 28 May – and the chicks were confirmed on 18 June. They have both done very well this year, and even made a friend from next door – even if the parents didn’t always approve. The A chick now has ring AANN and the B has AAVC – this will help us keep track of them and into the future. We saw them fledged to the beach and departing for Africa. We will miss them!